The company sweetened its offer Wednesday — $71.3 billion for Fox's movie studio, along with Fox's (FOX) regional sports networks and cable channels like FX and National Geographic. That's more than the $65 billion Comcast (CMCSA) offered a week ago. Disney (DIS) had initially bid $52.4 billion for Fox in December. Fox described the Disney offer as superior, and the two companies entered into a merger agreement. But that doesn't mean it's a done deal. 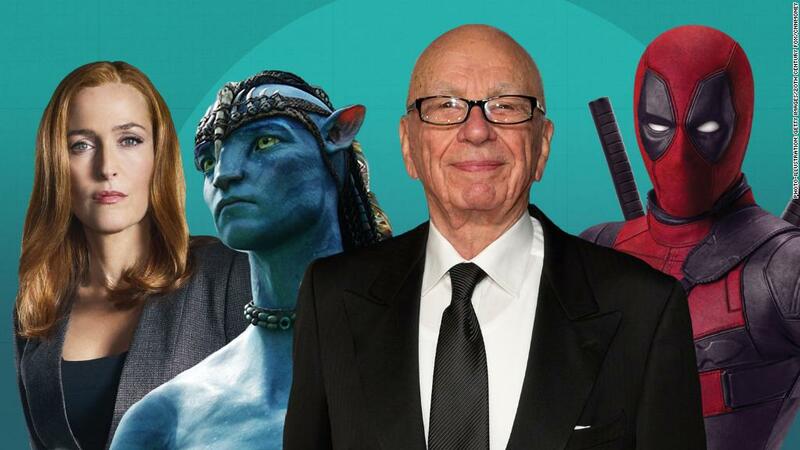 Rupert Murdoch, Fox's executive chairman, said Fox is open to better offers. That court decision paved the way for Comcast's attempt to swipe Fox from Disney. Like AT&T, Comcast is a content distributor that wants to buy a content creator. AT&T's win was seen by some as a green light for a Comcast-Fox partnership. "We believe that we have a much better opportunity — both in terms of approval, and the timing of that approval — than Comcast does in this case," he said. Iger added that Comcast may still have significant regulatory hurdles. The company isn't just a cable provider, he said, but a broadband provider, too. That kind of ownership wasn't addressed in the AT&T case. "It's just simply an apples-to-oranges comparison," Iger said. Disney's new offer is essentially the same as the first — just with a higher valuation for the Fox assets. But it comes with one key change designed to stave off Comcast's all-cash offer: a provision that allows Fox shareholders to decide whether to accept their payment in cash or stock. "We've always indicated that our balance sheet was not only a financial asset, but we viewed it as a strategic asset," Disney Chief Financial Officer Christine McCarthy told investors Wednesday morning. "If there were a compelling acquisition that we determined was worthy of us taking our leverage up, we would certainly consider that." Buying Fox, she added, "is one of those opportunities." Wall Street analysts say the mix of cash and stock puts Disney in a better position than Comcast. McCarthy said Disney expects the stock vs. cash payout to split evenly, meaning the company would need to raise about $36 billion of debt to fund the deal. Comcast would have needed much more debt — up to $65 billion — to pay for its all-cash bid. And it could have to borrow even more if it makes a higher counteroffer. Comcast's initial bid, if accepted, would have made it one of the world's most indebted companies in dollar terms, excluding banks, according to the Moody's ratings firm. Both Disney and Comcast would assume Fox's debt, too. "Before, the only outstanding question was whether Disney's board and management would go to the mat on this transaction," wrote MoffettNathanson analysts in a research note. The answer, they added, "is clearly yes." Murdoch said Fox believes Disney's offer is better than Comcast's — but it would consider bids from other companies, including a revised proposal from Comcast. Whether that will come together is unclear. Comcast did not immediately answer a request for comment. Trip Miller, a Disney shareholder and managing partner at Gullane Capital Partners, said Disney's early morning announcement was likely a "strategic move." The Fox board had been expected to discuss Comcast's bid Wednesday during a regularly scheduled meeting. "They love to catch each other off balance and keep each other guessing," Miller added. "I think there will be a lot more chess played in this game on both sides." He wasn't sure, though, what a Comcast counteroffer would look like. One sticking point for the Murdochs may be that accepting a bid that consists entirely of cash would saddle Fox with a hefty tax bill. "I think Comcast has to come back with something creative to address this tax situation," Miller added.